*Please note we have a special rate of $599 for students and post-docs. 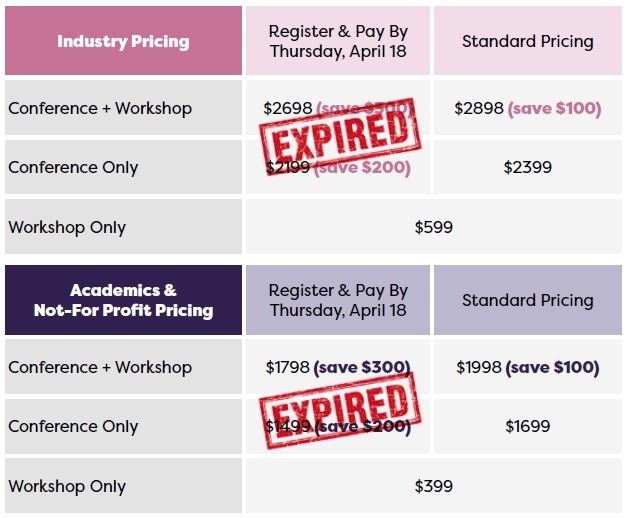 Please note that discounts are only valid when two or more delegates from one company book and pay at the same time. Group discounts cannot be used in conjunction with other discount codes or offers, other than the early booking rates. To qualify for this rate, the candidate must have an academic affiliation only, and cannot be currently employed by industry. This includes PhD students and post-docs currently working in a research position. Lecturers and Professors are not eligible for this rate. To qualify for this rate, the candidate is considered a senior academic (PIs, Supervisors, Lecturers & Professors). If you are unsure which academic rate best applies to your position, please email info@microbiome-movement.com and we’d be happy to discuss.